Cole, William, editor. New York A Literary Companion. Rikeman, A. A. The Evolution Of Stuyvesant Village. (New York City) Tenth to Bleecker Streets, Broadway to Second Avenue and around there. Riis, Jacob. How The Other Half Lives Studies Among The Tenements Of New York. Wood, Andrew F. New York's 1939-1940 World's Fair Postcard History Series. Adams, Arthur. The Hudson Through The Years. From Gotham to Diane Arbus, from	New York's Left Bank to Macy's Gimbels, and Me, we can help you find the new york books you are looking for. As the world's largest independent marketplace for new, used and rare books, you always get the best in service and value when you buy from Biblio.com, and all of your purchases are backed by our return guarantee. 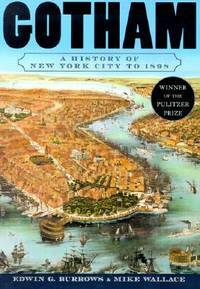 In this epic, Pulitzer Prize-winning work, Burrows and Wallace have produced a monumental history of New York City--ranging from the Indian tribes that settled the island of Manna-hatta to the consolidation of the five boroughs into New York in 1898. Includes index. Bibliography: p. -1177. Rem Koolhaas is the internationally known architect, a founder of the Office for Metropolitan Architecture (O.M.A.) in Rotterdam, and author of the critically acclaimed S,M,L,XL . Our Crowd is a book by Stephen Birmingham that documents the lives of prominent New York Jewish families of the 19th Century. Historian Louis Auchincloss called it "A fascinating and absorbing chapter of New York social and financial history... " There have been 14 editions of the book as of 2007. James Sanders, a practicing architect, is the cowriter, with Ric Burns, of the award-winning public television series New York: A Documentary History , and the coauthor, with Burns and Lisa Ades, of the companion volume, New York: An Illustrated History . He has written on architecture and cities for the New York Times , the Los Angeles Times , Vanity Fair , Interiors , and Architectural Record , and has completed design and development projects for the Port Authority, the Parks Council, the Landmarks Preservation Commission, and other civic groups and commercial clients in New York and Los Angeles. From the Hardcover edition. "Published in conjunction with the exhibition Left Bank New York : artists off Washington Square North, 1900-1950, curated and organized by Virginia Budny for La Maison Franc̦aise of New York University, New York City. The exhibition is on view from October 27 to December 15, 2006, and at the Snug Harbor Cultural Center, Staten Island, New York, in Spring 2007"--Cover, p. . Includes bibliographical references.